Around 1 mile of the River Ouse, out in the country on the Carlton Road, Harrold, near Olney. This section of the Ouse is generally slower, deeper and wider than most other MKAA river sections which has produced chub to 4lb, bream topping 6lb and good roach and tench. 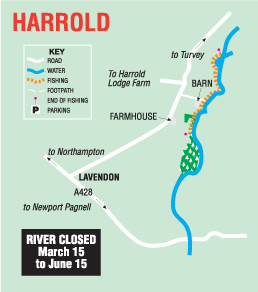 Access is via two farm tracks off right hand side off the Lavendon to Harrold road (travelling from Olney). Caution, can be muddy in wet weather. Limited parking, please do not obstruct the farmer's access.